Description - Naturesort 8 slat composite deck tiles are composed of bamboo and plastic making them resistant to weather and insects. 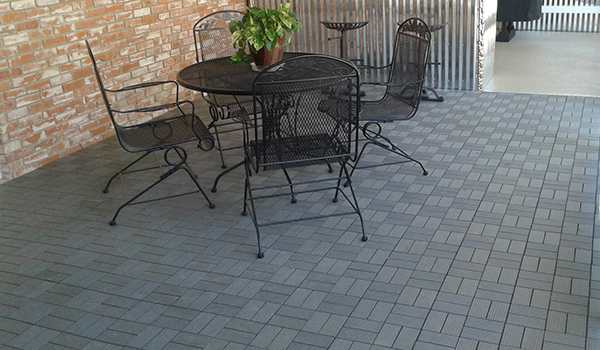 Easy to install and maintain, these deck tiles are very Eco-friendly and are more durable than solid wood. Being fade resistant makes these tiles great on decks, in outdoor showers and much more. 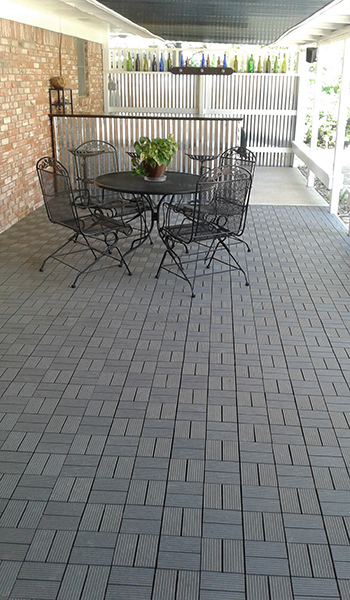 These outdoor deck tiles are backed by a 20 year warranty. 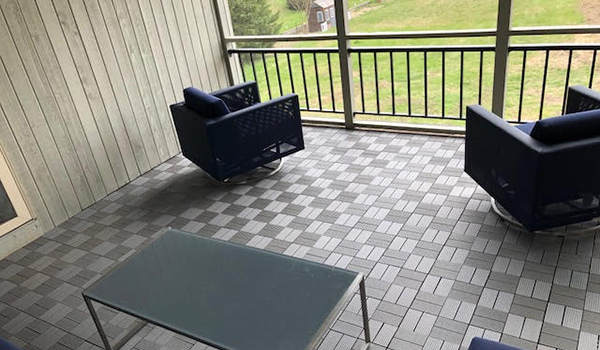 Recommended Uses – Naturesort Deck Tiles are great for decks, balconies, home offices, walk-in closets, outdoor shower areas, or partial areas in a bathrooms, showers, or closets. When you come up to a wall or object, don’t worry. Just measure the area and cut the tiles with a tile cutter and put the trimmed tiles into place. Easy snap together installation. DIY Friendly. Can I install these on EPDM roofing material or will it damage the roofing material? Deck tiles are not recommended to be installed directly over EPDM roofing, as any sharp pieces underneath the floor could cause it to tear. Can you pressure wash it? How is it stabilized up against the side of the house? You can power wash them and use a decking solution. Deck tiles are an overlay product, they do not screw into anything or glue down to anything. Its similar to putting a rug down. How do you finish an exposed edge? On the sides that have exposed tabs, we recommend cutting the tabs off with a table saw or tile cutter. Can these be installed on top of an outdoor gravel base? For best results, we recommend installing our Naturesort Deck Tiles directly over concrete, but you can try to install these tiles over a level and very dense outdoor gravel base if you wish. Can these tiles be applied over wood? If so, how? Is this product slippery when wet? 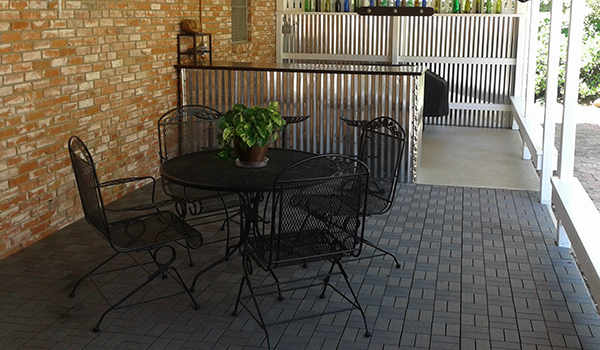 Naturesort Deck Tiles (8 Slat) can be installed over wood. When wet, these tiles can be somewhat slippery, but with these tiles being vented, they are more slip resistant than concrete or tile. This is the finest product on the market. I covered a redwood deck that continually needed painting, the sun and rain had really started to weather the 2x6 red wood decking. After an extensive search I found a product that is perfect. The tiles allow for moisture drainage and are very easy to install. No other product had the features needed.